June 20, 2014 · by Zack Reyes · Post may contain affiliate links. See my disclosure policy here. I like Venus razor coupons because they are generally a nice value. With Venus razor coupons, you can save up to $5 or more. Sometimes, you can even find BOGO free Venus razor coupons! Most of the time, this type of coupons is found via a rare online promotion or from an in-package coupons. A typical value of a Venus razor coupons is $4 or $5 off of one of their premium razors. Where can I find Venus razor coupons? You can find venus razor coupons in a number of places. Every month, Procter and Gamble puts out a newspaper coupon insert called the P&G Saver. There are always Venus razor coupons inside of that publication. Be sure to get your hands on one of those, as it is the best consistent source for Venus coupons. You can also find Venus printable coupons online from this site when available. Go here to print Venus coupons and to find other money saving grocery coupons. You can also keep tabs on the Venus Facebook page or their own website to try and get a heads up on additional online printable coupons that happen to be available. Also, separate from Venus razor coupons, be on the lookout for rebates from P&G. They used to offer a lot more than they do anymore, but there is still an occasional rebate that includes Venus products. If you can find one of those, you can really get some nice savings as well. 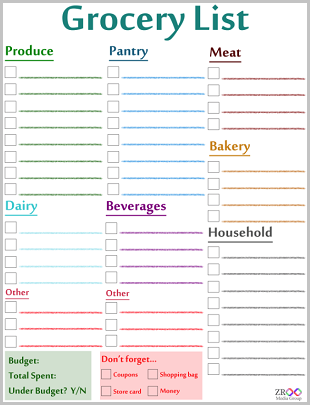 To print money saving grocery, household and personal care coupons, click here! Additionally, be sure to use your Venus razor coupons in conjunction with a store sale or promotion. I have specifically seen Target put Venus razors on sale at the same time as offering a $5 Target gift card for purchasing two razors. This is such a great deal because you can use 2 coupons on the purchase of the necessary products and still get the gift card. If, by chance, Target has a store coupon out for Venus razors, you can really add up the savings! 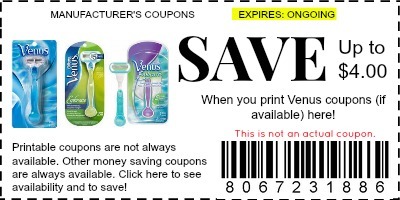 Be sure and print Venus coupons right away when you see them online and clip them if you see them in newspaper inserts so you have them ready to go when a sale does happen, or when you find a store coupon that you can stack with the Venus razor coupons! Expert use of Venus razor coupons will mean there is really never a need to buy those really expensive razor refill cartridges. even though there are coupons our for them, they are rarely the best way to go for coupon users. Be smart and diligent about finding sales for Venus razors and you'll pay a lot less than refill packages.